March is coming in like a lion this year, but despite the nor’easters and snow this week and last week, our crew is in full spring mode! re-creation of MARIAM, a Gil Smith catboat. Designed by Ezra Smith and Matt Smith, NA. 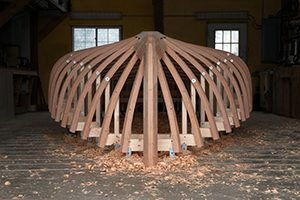 Artisan Boatworks’ team of master wooden boat builders have partnered with visionary owners to build more licensed replicas of Herreshoff designs than any other builder since HMCo closed its doors in 1944. Over the past two decades our craftsmen have earned a reputation for the world’s finest custom replicas of classic daysailers, runabouts, launches, Downeast picnic boats, and rowing craft. For the true connoisseur of natural materials we employ traditional plank-on-frame construction, and for cutting-edge performance we excel in the application of cold-molded epoxy, sheathed strip, and carbon-fiber composites – all while maintaining the timeless beauty that embodies the spirit and intention of yachting’s greatest designers. Artisan Boatworks has earned international acclaim for our extreme attention to detail and our distinctive ability to marry classic appearance with contemporary performance, comfort, and usability. Our craftsmen and designers have graced the Atlantic with a symphony of distinguished replicas, modifications of existing designs, and new Spirit of Tradition yachts to match individual style and practical requirements. You won’t find our boats in brokerage listings – but you’ve admired them on the water. No wooden boat with significant history and pedigree is beyond repair. Our team of restoration specialists has developed a renowned understanding of the research, appraisal, and approach necessary to return important heirlooms to as new or better condition, which is why the most discerning owners throughout the world continue to bring their projects to Artisan Boatworks. Our particularly holistic approach to restoration is built on several decades of experience lofting and re-establishing hull shape and sheer, identifying and correcting short-sighted fixes and engineering deficiencies; and preserving original design details, materials, and techniques. We do it once, do it right, with absolute integrity, and to an extraordinary level of finish. This is why the heirlooms restored by the team at Artisan Boatworks win the most prizes, win the most races, and will continue to nurture your family memories for generations to come. Our clients are extremely proud of their wooden boats, and recognize that specialized off-season storage and expert finishing are critical to their health, appearance, and performance. The service department at Artisan Boatworks cares for over sixty of these distinguished wooden boats, rivaling the capacity of any such yard in the Northeast. Our greatest source of pride, however, is our reputation for the extraordinary level of individualized customer service, world class standard of finish, and custom tailored maintenance services we bestow upon each and every boat and owner. 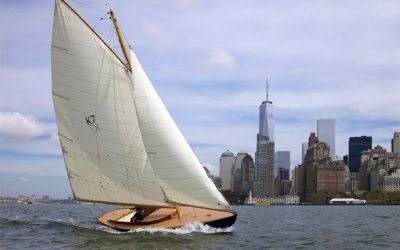 From New York to Northeast Harbor – experienced wooden boat owners choose Artisan Boatworks’ full service “mooring to mooring” storage and maintenance program for our proven efficiency, accountability, and because we love the boats in our care like family. To an owner, the off-season process of hauling, storing, maintaining, and commissioning their wooden boat can be as enjoyable and fulfilling as time spent on the water. The best of being a customer of Artisan is that they do exactly what they say that they will do, and to an extraordinary level of quality. I would encourage you to visit Artisan’s premises. One genuinely appreciates there the art of building, restoring and maintaining beautiful wooden boats, and the commitment and skill of the Artisan team. Alec treats his customers with the greatest consideration. In 45 years of boat ownership, I’ve not experienced better. We are custom boatbuilders who build and restore wooden yachts designed and built by Nathanael Herreshoff, L. Francis Herreshoff, William Fife, Starling Burgess, K. Aage Nielsen, B. B. Crowninshield, John Alden, Sparkman & Stephens, Joel White, Henry B. Nevins Inc., Walsted Baadevaert Shipyard, and some of the premier Maine boatyards and Maine boatbuilders of the last century like Rice Brothers and Hodgdon Yachts.